Vinayak Damodar Savarkar turned his back on his lieutenants in order to escape charges in Gandhi's murder. But a commission established his guilt posthumously. This is the second in a two-part series on V.D. Savarkar. Read the first part here. Five months after India’s independence, on January 14, 1948, three members of the Hindu Mahasabha – Nathuram Godse, Narayan Apte and Digambar Badge, an arms dealer regularly selling weapons to the Mahasabha – arrived at Savarkar Sadan in Bombay. 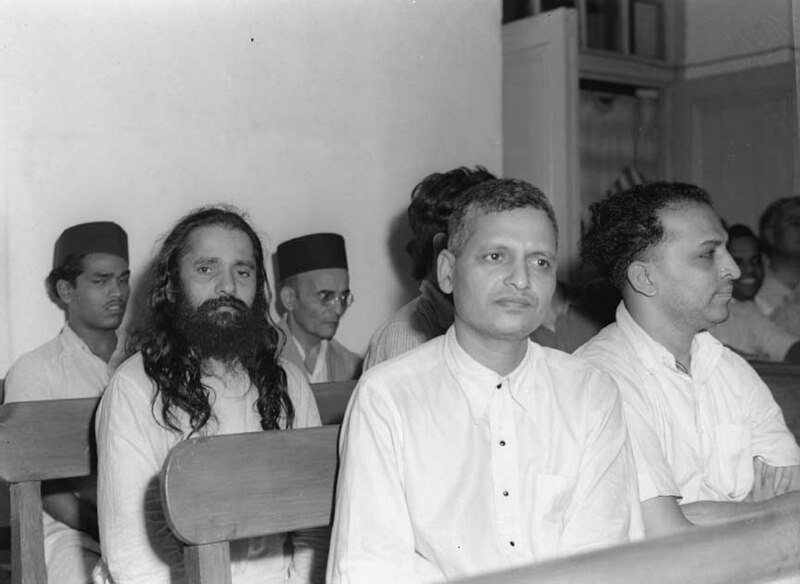 Apte and Godse were among the very few who “had the right to move immediately past that room up a flight of stairs to the personal quarters of the dictator of the Hindu Rashtra Dal,” according to Larry Collins and Dominique Lapierre’s book, Freedom at Midnight, written based on information acquired from in-depth interviews and extensive research of official documents including police records. Badge, who did not have such unrestricted access to Savarkar, was told to wait outside. Apte took from him the bag containing gun-cotton slabs, hand grenades, fuse wires and detonators, and went inside with Godse. When the duo returned to Badge after 5-10 minutes, Apte was still carrying with him the bag of weapons, which he asked Madanlal Pahwa – an angry Punjabi refugee who had come from Pakistan after partition – and his seth, Mahasabha member Vishnu Karkare, to carry with them to Delhi. Badge – who had known Savarkar since 1944-45 and Godse since 1940-41 – was asked by Apte the day after their visit to Savarkar Sadan if he would be willing to join them to Delhi. “Apte told me that Tatyarao (Savarkar) had decided that Gandhiji, Jawarhar Lal Nehru and [Huseyn Shaheed] Suhrawardy should be ‘finished’ and had entrusted that work to them,” said Badge – a co-conspirator in Gandhi’s murder who secured a pardon in exchange for turning into an approver and divulging the details of the conspiracy before the court. After sorting out some household affairs in Poona, Badge returned to Bombay on January 17 to join them on their mission to Delhi. “Godse suggested that we should go to take one last ‘darshan’ of Tatyarao (Savarkar),” Badge testified. On entering the compound of Savarkar Sadan, Apte asked Bagde to wait in the room on the ground floor and went upstairs with Godse. When the two returned downstairs, they were followed by Savarkar who wished the duo: “Yashasvi houn ya (Be successful and come)”. But successful it wasn’t in the first attempt made on Gandhi’s life three days later on January 20, in the Birla House in Delhi. The plan to assassinate Gandhi during his public prayer failed and Pahwa, who had set off a bomb near the podium over which Gandhi sat addressing the crowd, was arrested. The rest of the conspirators began their run from Delhi. “Madanlal was still loyal to his fellow conspirators,” Collins and Lapierre wrote. “[He] was sure they would try again. He was determined to win them as much time as he could by refusing to talk (to the police)… Then, calculating that the others had by now had time to flee, he gave a harmless account of their activities in Delhi. Suddenly, in a moment of self-assertion, he… admitted he had been at Savarkar Sadan with his associates and boasted he had personally met the famous political figure. 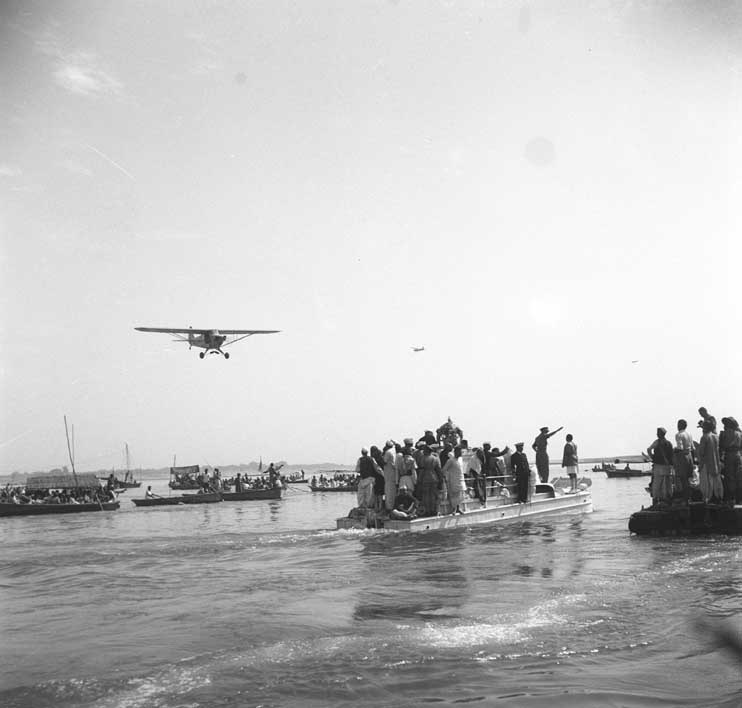 The police informed Gandhi that Pahwa was not a lone wolf and that “there was a serious likelihood that others would try again.” The then DIG of Delhi, D.W. Mehra, insisted on the tightening security at Birla House and requested Gandhi for permission to search suspicious people coming into the premises to attend his prayer meetings. 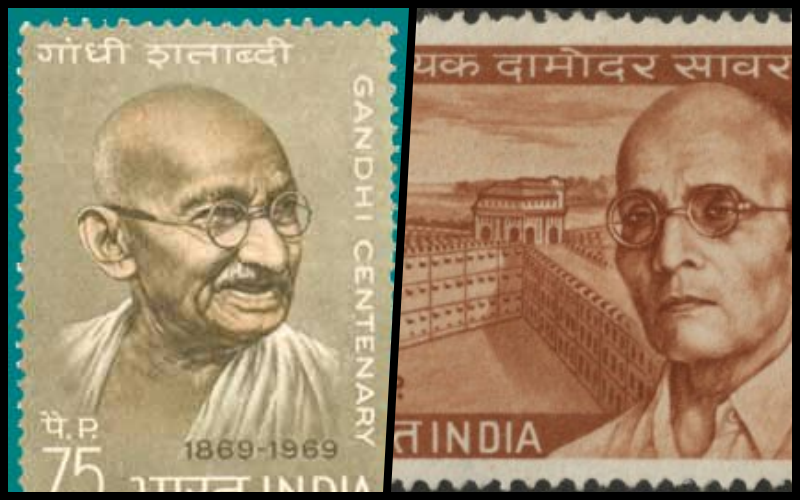 Gandhi’s unwavering faith in the Hindu god, Rama, was indeed a blind one, as the Hindutva fanatics demonstrated to the world a few days later, when Godse – after another long meeting with Savarkar 3 -4 days after the failed attempt – returned to Delhi and shot Gandhi thrice at point blank range on January 30, 1948. “The government had only to accept this humiliating and explicitly open-ended offer if its aims were political,” lawyer and historian A.G. Noorani said. But “[t]hey were not.” The Delhi police arrested Savarkar the following month. A special court, headed by Justice Atma Charan, was constituted on May 4. Another meeting of Savarkar with Apte and Godse on January 17, when Badge witnessed Savarkar wishing the two: “Be successful and come back”. Apte telling Badge on leaving from Savarkar Sadan that Savarkar had predicted that Gandhi’s 100 years were over and there was no doubt the task (of assassinating Gandhi) would be successful. After thus attacking Apte, who refused till the very end to admit in court that Savarkar had anything to do with the conspiracy, Savarkar then pointed out that in any case both Apte and Godse deny having told Badge that Savarkar had decided that Gandhi had to be assassinated. The same reasoning was again used to defend himself from Badge’s claim of having been told by Apte that Savarkar had predicted Gandhi’s time was up. 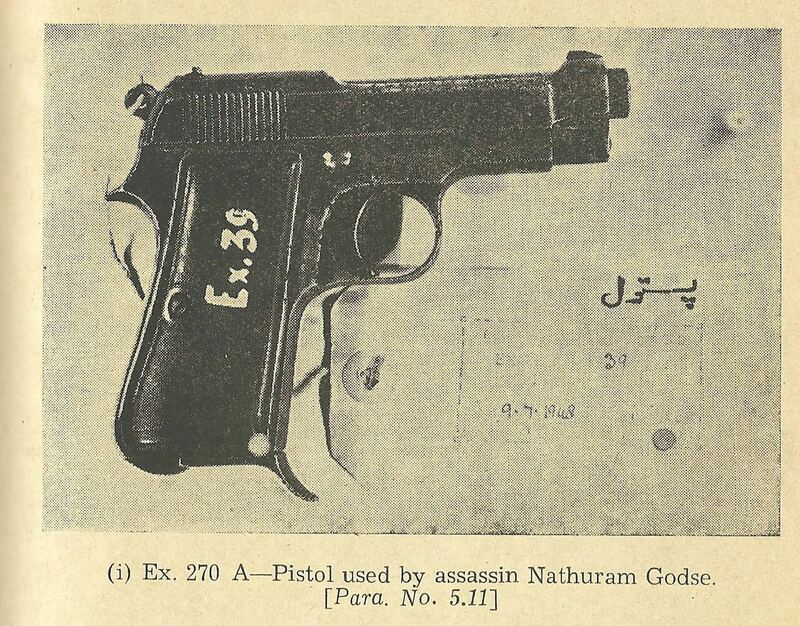 Photograph of the pistol used by the Hindutva activist Nathuram Godse to assassinate Mahatma Gandhi. Credit: Jeevan Lal Kapur Commission of Inquiry report, 1969. This evidence, the judge pointed out, does not corroborate the part of Badge’s testimony where he claims to have heard Savarkar saying “Be successful and come back” to Godse and Apte. In the absence of records that reveal the subject of the conversation that took place on the first floor between Savarkar, Godse and Apte, it cannot be presumed that Savarkar’s alleged remark was made in reference to the mission to assassinate Gandhi. If the words above were written in the judgment by Justice Charan, Savarkar would not have escaped the gallows. But they weren’t. These words are from contemporary times – from the Supreme Court’s judgment indicting Afzal Guru. Justice Charan subscribed to a different school of legal thought which found it worthy to take the risk of letting a thousand criminals go unpunished in the process of ensuring that not a single innocent man is penalised. Thus even though he regarded Badge as a truthful witness, in the absence of independent corroboration of some crucial parts of his testimony, the judge found it “unsafe” to convict Savarkar, in spite of the circumstantial evidence which Payne had found “impressive”. So it was that Savarkar was acquitted, while Apte and Godse were awarded death penalty. 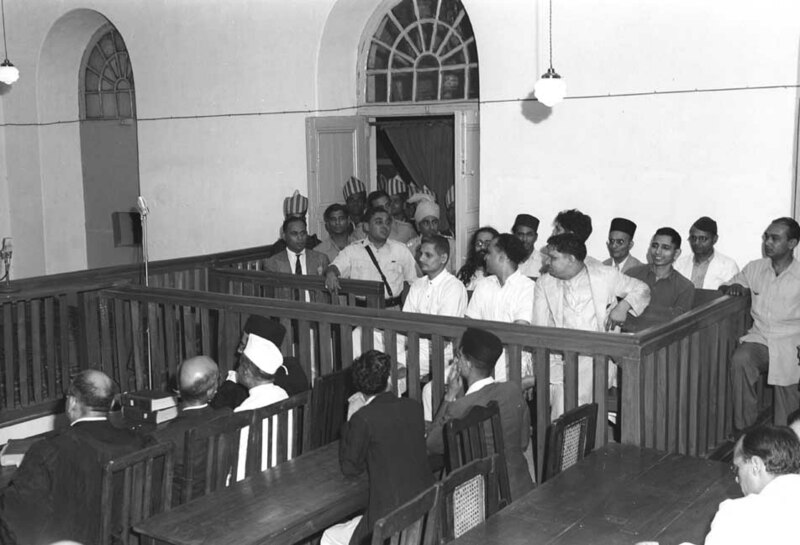 Another view of the men charged with the assassination of Mahatma Gandhi during their trial at the Red Fort in May 1948. Savarkar is in the last row. Credit: Photo Division, GOI. But during the trial, Savarkar did not even turn “his head towards.. Nathuram.. much less speak with him,” Inamdar wrote. This ‘cowardice’ out of which Savarkar chose to disown his ‘lieutenant’ (as Godse’s brother said he was regarded) stands in stark contrast to the audacity of the Hindu Mahasabha today, which – perhaps emboldened by Narendra Modi government’s great respect for freedom of speech – has publicly announced its mission to install Godse’s idols in temples across the country. Seventeen years after Godse was hanged – or “martyred”, as the Mahasabha tells us – Savarkar, then aged almost 83, renounced food and medicine in the beginning of February 1966 and died on February 26. But the truth about his role in Gandhi’s murder was not cremated with his body. 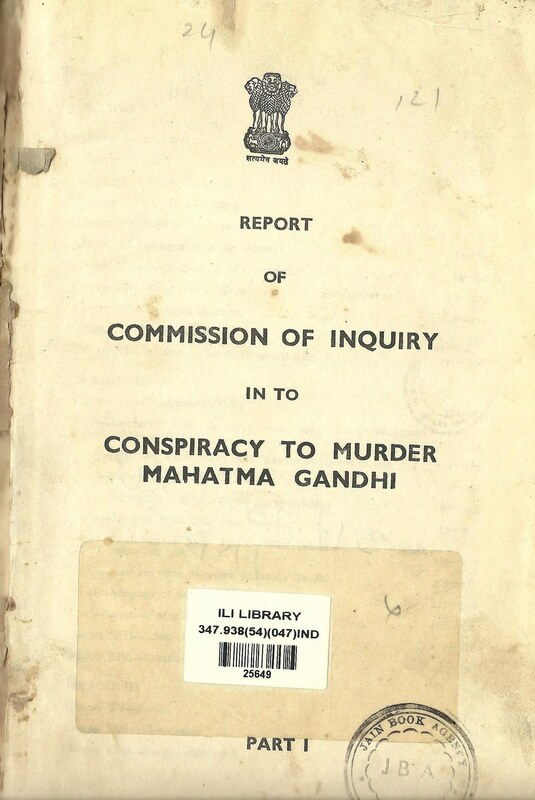 Only three years later, evidence found by the Kapur Commission implicated Savarkar in Gandhi’s murder. Cover of the Jeevan Lal Kapur Commission of Inquiry report. When Godse’s brother was released from prison in 1964, a programme was held to commemorate him. There, Bal Gangadhar Tilak’s grandson, G.V. Ketkar, boasted that he knew about Godse’s intention to kill Gandhi. What followed was a national controversy, which led to the setting up of a commission under Justice Jeevan Lal Kapur in 1969, with the mandate to investigate who all had prior knowledge of the plot to assassinate Gandhi, which authority they informed and what measures were taken by the authorities who received this information. Two of Savarkar’s aides who hadn’t previously testified during his trials spoke up before the commission. Their statements not only provided an independent corroboration of the two meetings with Savarkar which Badge had referred to in his testimony, but also revealed that before carrying out the assassination, Godse and Apte had met Savarkar once again on January 23 or 24, after Madanlal Pahwa’s first attempt on Gandhi’s life had failed. 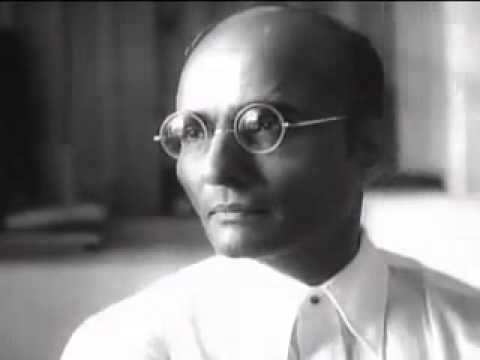 The findings of Kapur Commission which implicated Savarkar in Gandhi’s murder did not, however, discourage the first BJP-led NDA government led by Atal Bihari Vajpayee from installing a portrait of Savarkar, alongside that of Gandhi, in the central hall of the parliament building in 2003. 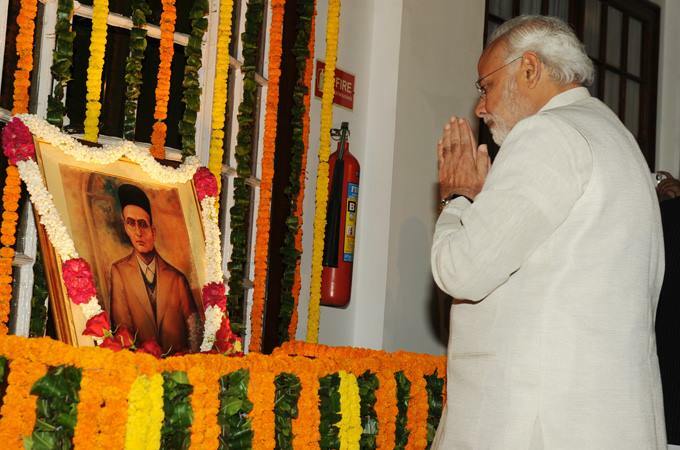 Neither do these findings of the Kapur Commission – or for that matter, the listing of the various incidents of Savarkar’s collaboration with the British – discourage Narendra Modi and other ministers in the government from celebrating Savarkar’s birth anniversary, year after year, and glorifying him as a great freedom fighter and a patriot. Because allowing a truthful portrayal of the father of Hindutva ideology will invariably compromise the prospect of turning India into the Hindu rashtra he had envisioned. Spreading lies to counter historical facts and reinforce the myth of “Veer” Savarkar is therefore an imperative for the success of the project unfolding before us. As in previous years, May 28, 2017, the 134rd birth anniversary of Savarkar, once again provided a platform for Hindutva ideologues – inside and outside the government – to repeat the lies about their founding father. For “with sufficient repetition,” Goebbels had once said, “[i]t would not be impossible to prove.. that a square is in fact a circle.” Or, for that matter, that cowardice is in fact courage. That collaboration with the colonial government is the same as fighting for freedom. And that a sectarian ideologue who was prepared to go to any length to oppose those who stood for the unity of all Indians is in fact a great patriot and national hero. Pavan Kulkarni is a freelance journalist.